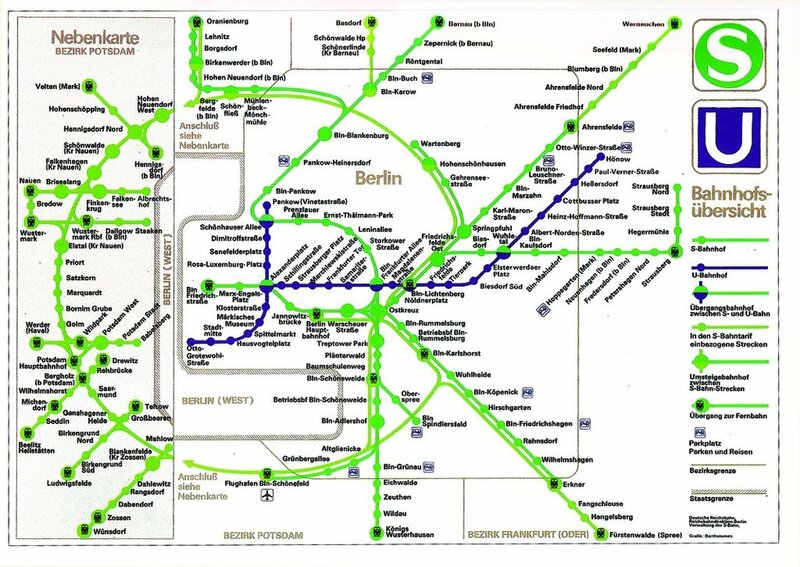 And that something is of course West Berlin, which had it’s own U-Bahn and S-Bahn lines (although you wouldn’t know from this map). The reason of course is rather simple, East Germans could not travel on the West Berlin lines so why show them? Instead the map (nearly) erases West Berlin by showing an insert of the Potsdam area (which was in East Germany) instead. Of course prior to the construction of the Berlin Wall in 1961 both networks had been integrated. However, after the Wall each one was almost entirely cutoff from the other, creating a series of ghost stations. 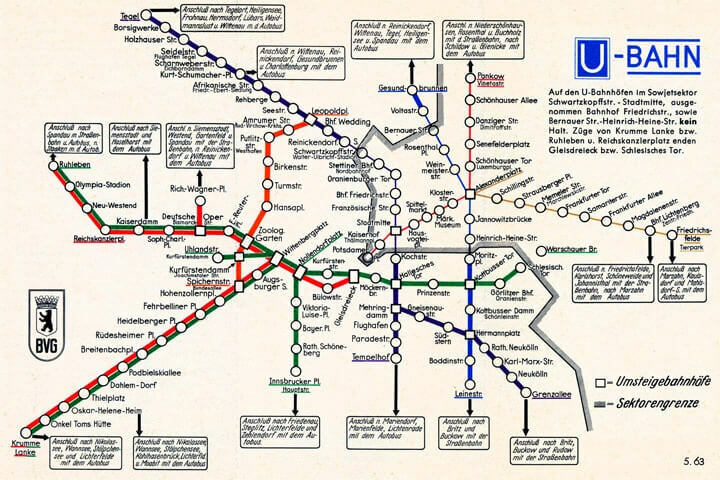 The one interesting exception was Berlin-Friedrichstraße station, which while in the East, also allowed West German travellers to transfer between lines. However, East German citizens were cutoff from the sections of the station that allowed travel to the West by a metal-glass barrier. In effect, Friedrichstraße was a microcosm of the situation in Berlin. Finally, it’s also interesting to see how West Germany dealt with this issue as the map below illustrates. Published in 1963 (2 years after the wall went up), it goes to the opposite extreme and shows one unified network. Although the lines in the East are shown more faintly and the Wall is clearly visible in grey.